Castey is known among cookware connoisseurs for its patented heat diffusion technology for induction cooking. 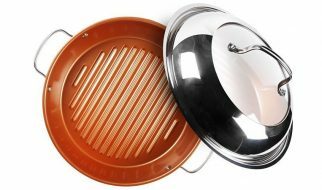 It has gone the extra mile in ensuring that its cookware have the right mix of alloys to ensure that the magnetic process-produced heat of induction gets to where it needs to go instead of being diffused to the sides of the cookware or not making it from the heating disk to most parts of the cookware. Fundix’ technology has been corroborated by an independent testing organization, the Applus Lga Technological Centre to deliver heat as Castey claims. Accordingly, this nonstick cast aluminum induction saute pan is definitely in a different level as far as fully tapping the heating and cooking power of induction energy. In this review, we size up this Fundix model based on the adequacy of its special features as well as its ability to deliver long term value, cooking versatility, handling and ease of use issues, maintenance and cleanup, and durability. Made from cast aluminum, the first thing that is easy to notice about this induction cookware is its solidity and thickness. Its easy to think that its mostly aluminum construction put this model at a disadvantage. While it might be relatively light and therefore easier to handle, it might have paid too high a price for this feature in the form of less efficient induction conductivity and lower quality heat handling overall. Thankfully, we were pleasantly mistaken. This Fundix model, along with other cookware bearing the Fundix brand, was actually engineered for optimal thickness and shape in conducting heat efficiently and effectively. In other words, its shape, size, and form was engineered from the ground up to maximize its proprietary Integral Induction Base technology that enables it to heat food. While this unit is most aluminum, don’t let its construction and material selection fool you-it actual facilitates the induction heating process at a very high level and is designed to get the heat to where it needs to go. Ultimately, you get the best of both worlds-a large yet light form factor made possible by cast aluminum while preserving high induction capability. At the end of the day, function trumps form when it comes to cookware-induction heat needs to get to where it needs to go quickly, effectively, and efficiently. It is a testament to this cookware brand’s focus on delivering both form and function that this Fundix saute pan is able to conduct a tremendous amount of heat in such a light form while still being robust enough to handle quite a bit of food. 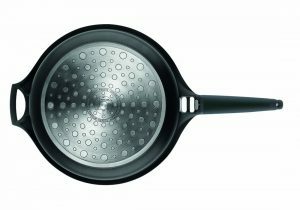 Keep in mind that this non-stick saute pan accommodates 4.75 quarts of capacity. Not too shabby. And it is able to heat up that content while remaining light and easy to handle. You get to cook food sooner rather than later and be able to move it from cooktop to plate or kitchen top in no time flat. This unit also comes with a lid that has a protective rim for longer unit life. As far as long term value is concerned, this unit’s capacity and quick high heat capabilities make for a great long term investment because it is made of aluminum that doesn’t warp. You can rest assured that you can heat up tasty food with this cookware for a long time to come. Of course, the longer you use it, the cheaper your total costs get. 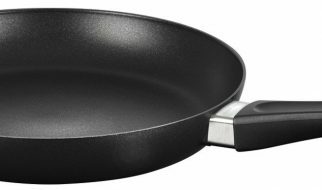 When it comes to cooking a wide range of food, this saute pan’s large form as well as its cooktop versatility ensures you can use it under a wide range of circumstances. You can even go out on the road and you won’t be at a loss for a cooktop for this pan. Whether you’re using an oven to bake food partially cooked in this pan or your typical gas or electric range, this pan’s high heat conducting construction and design guarantees you optimal heat and makes faster cooking possible. Talk about convenient. Since this Fundix model is made of cast aluminum, you can quickly move this unit around your cooktop. It is light enough, at 5 pounds, to move from one cooking surface to another. You can cook up to 4.75 quarts and not skip a beat as you quickly move this unit from one heating pad to the next to accommodate another pot or pan. Its black handle is removable which adds to its portability and ease of handling. You can quickly move it to your oven if need be. If you don’t have time to wipe down its non-stick surface with a soapy sponge under cool running water for a quick clean, you can just put it in the dishwasher. Totally dishwasher-safe, this unit really delivers ‘out of sight, out of mind’ cookware cleaning. Its removable handle also makes it easier to store if space is an issue for you. If you’re looking to maximize total use value, the Fundix truly delivers. Its strong cast iron aluminum construction enables it to take quite a bit of punishment over a long period of time. Its non-stick surface also keeps up with your use. Overall, given its solid heat induction and conducting capabilities as well as large capacity, this unit provides high quality durability that yields great value for me in both the short and long term. While its price is admittedly on the higher side of other similar cookware, the Fundix gives you a solid combination of a durable PFOA-free healthy non-stick surface in a relatively light yet powerful form that delivers solid heat efficiently. Heat up your food faster and more efficiently with this trustworthy cookware. It is definitely worth the investment if time, convenience, and versatility are important to you.